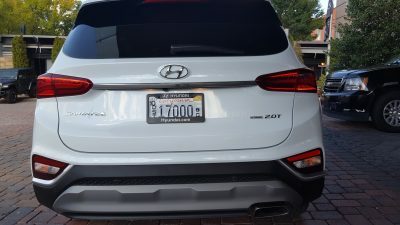 Hyundai is in a state of change these days. 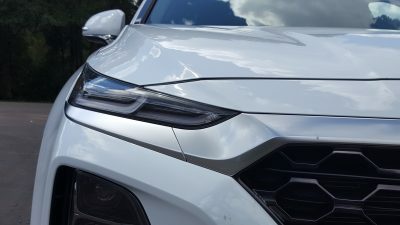 The Korean car company once known for having a near exclusive lineup of car entries is in the middle of rapidly transforming its utility vehicle lineup. 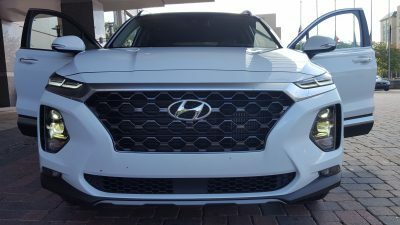 Things got off to a great start with the Hyundai Kona CUV, which is proving to be a successful entry for Hyundai in a rapidly growing chunk of the CUV market. 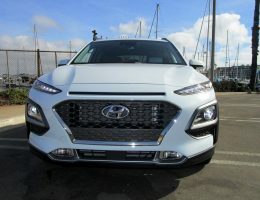 Now the company is setting its sights on bigger rivals with the 2019 Hyundai Santa Fe, but can this heavily revised Santa Fe repeat the Kona’s quick climb to stardom? 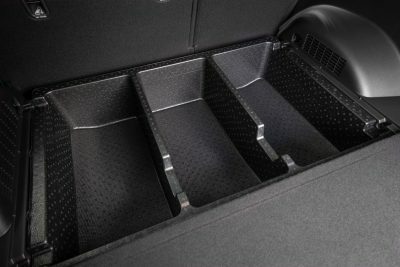 Or is it still short of matching SUV benchmarks? 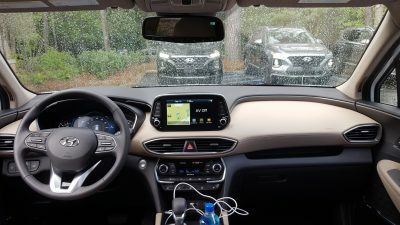 To find out, Hyundai invited us to beautiful Montgomery Alabama to spend some quality time with the 2019 Santa Fe, and show what this revised SUV can do out on the open road. 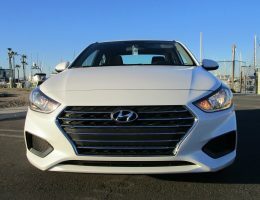 Before we go on any further, we might as well address the naming confusion that some buyers might experience when visiting their local Hyundai dealer. 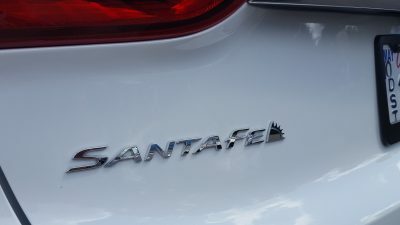 While the 2019 Santa Fe is effectively a replacement for the outgoing Santa Fe Sport, the longer wheelbase variant of the older Santa Fe will soldier on for one more year. 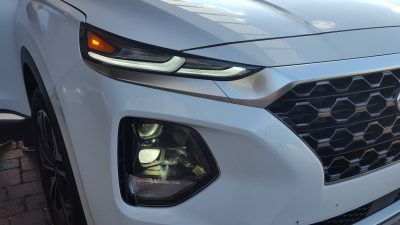 That particular model will be rechristened the Santa Fe XL, and is expected to hold the fort until a new replacement arrives in 2020. The older model also showcases the design differences between the two in rather striking fashion when viewed side by side. 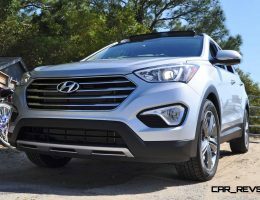 Unlike its predecessor, Hyundai engineers opted for a look that is more handsome than before, and also allows the Santa Fe to look more grown up at the same time. There’s subtle hints of Kona here, and the rear glass is more vertical than before, which is on par with other SUV entries of late. 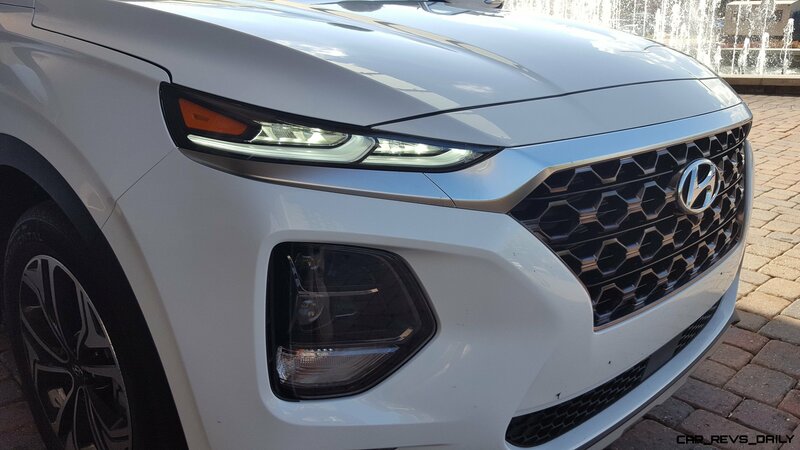 Shorter overhangs and an increase in length help channel the transformation even further, and allow the 2019 Santa Fe to boast more interior space as well. 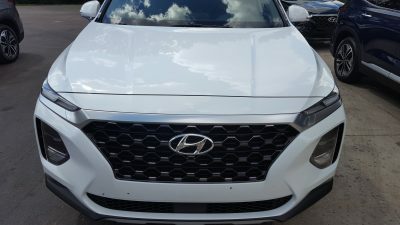 Hyundai engineers also increased visibility by incorporating 41 percent more glass area which also adds a distinct stylish touch to the Santa Fe. 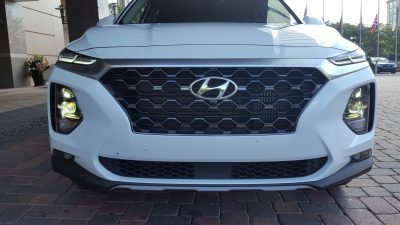 Hyundai’s “cascading” front grille is also present, and is available in either bright or black finishes. Our Ultimate tester had the black finish, and we actually preferred this form of grille over the chromier alternative. 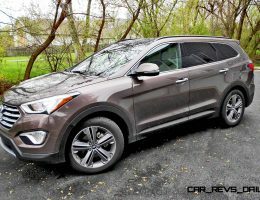 When viewed as a whole, the exterior styling is certainly more distinctive than some in the segment, including the Kia Sorento, Subaru Outback, and the Ford Edge. However, we still think that the Jeep Grand Cherokee, and the Nissan Murano stand out better when it comes to winning the aesthetics war with the former boasting more ruggedness, and the latter looking more state of the art. The grille’s polygonal design theme also carries over into the noticeably redone interior, which aims to be more upscale than the old Sport. 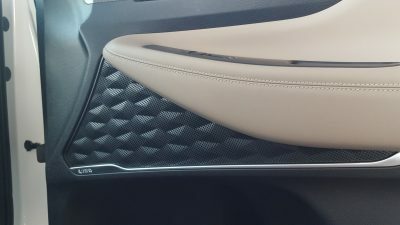 Yes, there are some cheap plastics scattered here and there, but Hyundai’s interior designers deserve a hefty bonus check for the finer details that make themselves more apparent upon closer inspection. 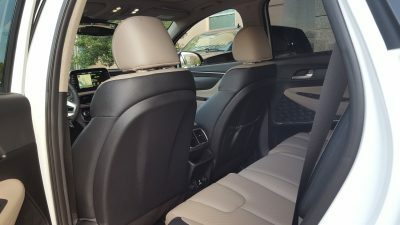 The leather seats in our tester were comfortable and supportive, and can be heated or cooled, with the latter item being very handy in the 90 degree Alabama sunshine. 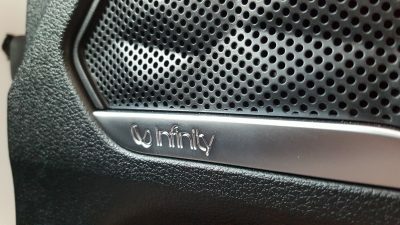 The speaker grilles for the optional 12-speaker Infinity sound system feature tasteful polygonal shapes, and we will give Hyundai props for not skimping on headliner and A-Pillar trim. 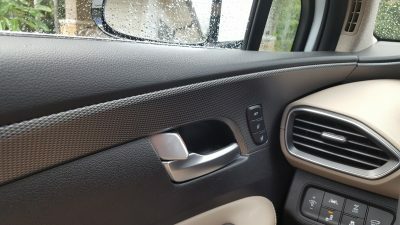 Typically these seldom noticed items are usually made of plastic or cheap mouse fur, but here, quality fabric trim greets the hands, and the way it felt was reminiscent of nice cloth handbags or wallets, with none of the mouse fur roughness that we typically encounter in other entries. 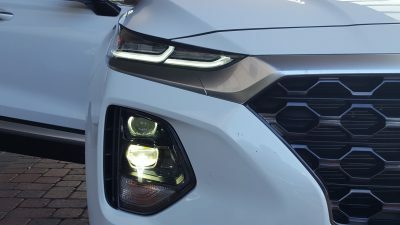 Visibility in our tester was very good (thanks in part to the additional glass) with the Santa Fe not having the chunky rear blind spots that haunt some of its competitors. 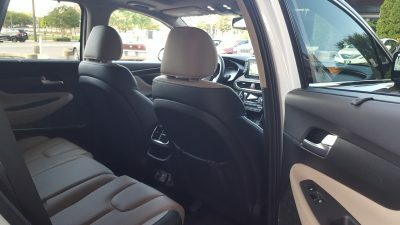 The second row is very spacious with headroom being perhaps the best that we have ever seen in a SUV. Ditto the sound insulation, with our Ultimate grade tester silencing virtually all the wind noise that it encountered on our drive. Some road noise does seep through of course, but that is an inevitability that we are willing to live with to enjoy the high levels of serenity that the Santa Fe has to offer. 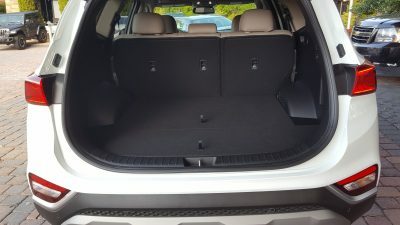 Cargo room is very generous for those that moonlight as weekend adventurers thanks to the 35.9 cubic feet of space that is available with the second row in place. 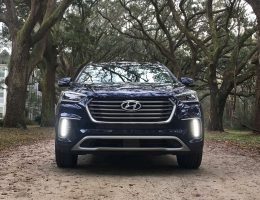 Fold it down, and cargo room jumps up to an impressive 70.3 cubic feet of space, which allows the Santa Fe to swallow an impressive amount of stuff. The interior’s trump card however lies within the 8.0 inch infotainment system. 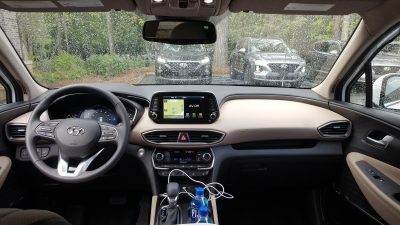 Like other recent Hyundai infotainment offerings, the unit in our tester was easy to operate, and we noticed that response to inputs was sharper than before. 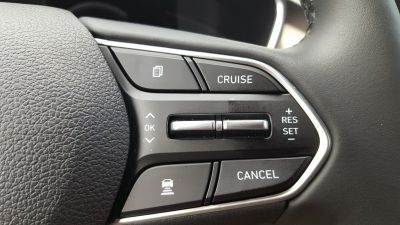 Apple CarPlay and Android Auto capability is standard which should not only please young buyers, but also allow the Santa Fe to stand out against rivals that still do not offer their buyers this level of digital versatility (especially in 2018!!!) 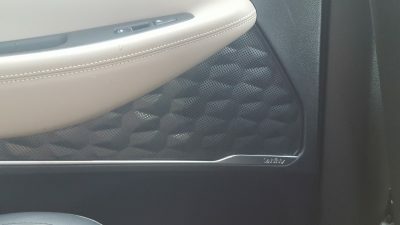 Sound quality from the fore-mentioned 12-speaker audio system was crisp and balanced, with minimal distortion and plenty of bass, with the latter being especially noticeable with certain rock and rap songs. We will follow up with this system again soon to see if it can measure up to the rigorous standards of our resident audiophile Emily. 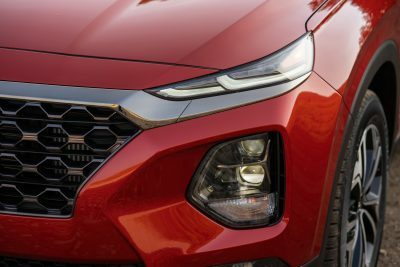 Performance for the 2019 Santa Fe will initially come from two engines. 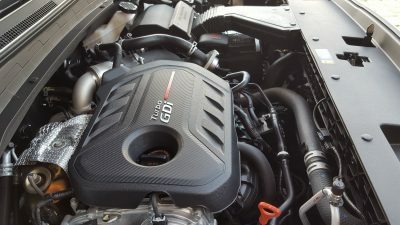 Base models make do with a 2.4 liter four cylinder engine that makes 184 horsepower, and are clearly tailored towards the bottom end of the SUV market. 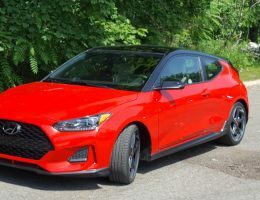 Limited and Ultimate grade models like our tester feature a 235 horsepower 2.0 liter turbocharged four cylinder engine. 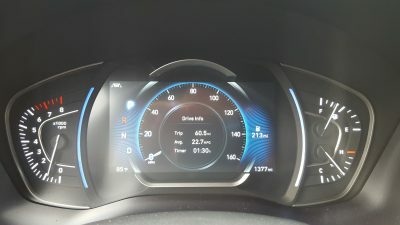 The Santa Fe is not a hot rod by any stretch of the imagination, but the engine does have a good amount of low end punch, and allowed our tester to make the sprint to 60 mph in a drama free 7.5 seconds. 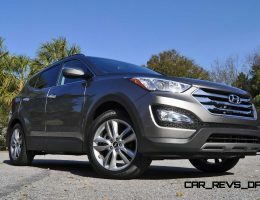 This is on par with others in the segment, and allows the Santa Fe to bring the fight to other turbocharged offerings in its segment. 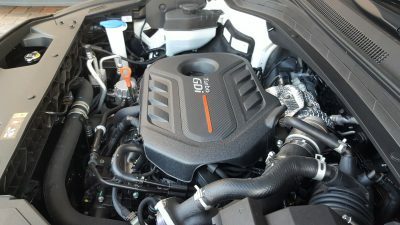 We did not have a chance to experience the base 2.4 liter in our commute through much of Alabama, but look for the bulk of buyers to gravitate towards the turbo four not so much for its acceleration manners, but rather for how smooth the engine feels during many types of driving scenarios. Handling in our tester was composed and stable. 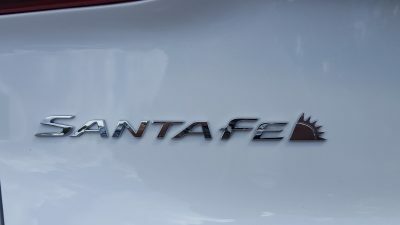 Like before, sportiness will not be a defining hallmark of the Santa Fe (despite Sport Mode’s best efforts at changing that perception.) 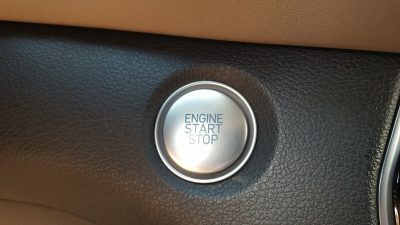 but buyers that want to have a high level of confidence and security will undoubtedly be pleased with what they find when they have a chance to slip behind the wheel. 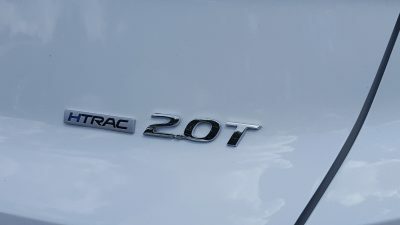 Our tester featured Hyundai’s H-Trac all-wheel drive system that helped the Santa Fe maintain its poise during a freak rain storm that swept through the state halfway into our drive with it. Look for H-Trac to strongly appeal to buyers in snowier locales thanks to the seamless power split between the front and rear wheels, as well as its built in snow mode. 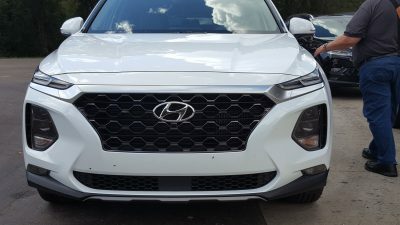 Like other SUV offerings, the steering in our tester felt a bit too light for our tastes, but the Santa Fe still did a good job delivering sharp handling, with the high levels of stability and confidence that actually encourages buyers to let loose alittle in corners thanks in part to the all-wheel drive system’s torque vectoring technology. 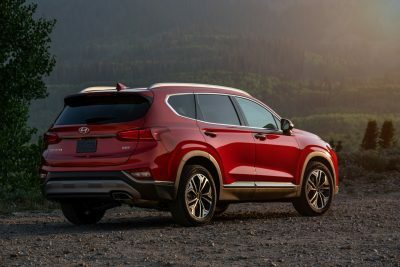 This is especially true considering that the Santa Fe’s chassis is a solid platform that has no problem taking curvier sections of pavement. This is partly due to the revised rear suspension, which is mounted vertically instead of being at an angle. 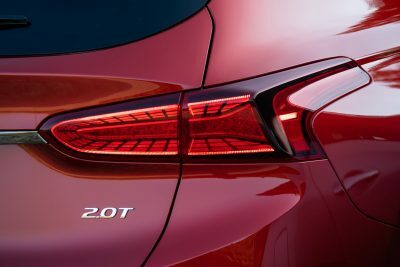 This change was aimed at improving comfort and stability, and Hyundai engineers largely hit a home run in achieving both of these goals. Turbo models do ride on larger wheels, and as a result, the ride is slightly firmer than the base model. 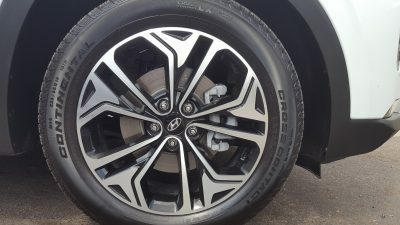 Buyers looking for more comfort can opt for smaller wheels, but the caveat is that the smaller hoops are only available on the base model, and that one cannot be equipped the turbo four. Shifts from our testers eight speed automatic were smooth and composed, but there were moments in rugged sections of terrain where we noticed rougher than expected shifts. 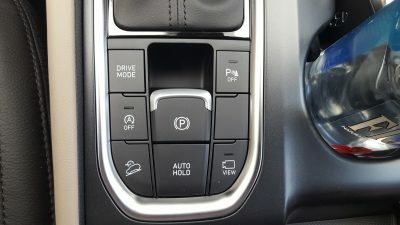 Higher trim levels feature steering wheel mounted shift paddles, but we recommend leaving the computer to its own devices in this regard, mainly due to how smooth the shift logic is by default, as well as how slow the paddles are at responding to inputs from the driver. Lastly, We will give Hyundai extra credit for one-upping General Motors when it comes to rear occupant safety. 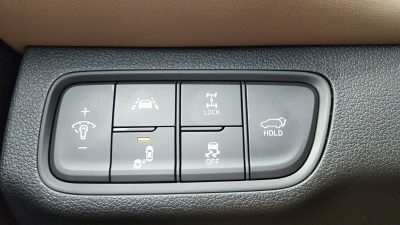 Like GM’s Rear Seat Reminder, the Santa Fe’s version alerts front seat occupants with a chime and instrument cluster display to check the back if the sensors sense any occupants there. Ignore this first warning, and that’s where the similarities end, with the Santa Fe’s second warning being more expressive, with the car flashing its lights and honking its horn to get your attention. 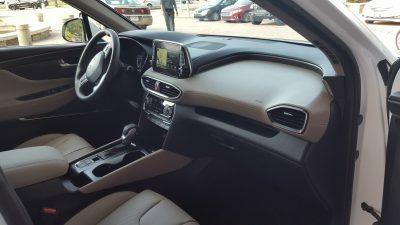 As a bonus, the Santa Fe gets high tech too, and will actually send a notification to your smartphone via the BlueLink app, as well as an email alert. 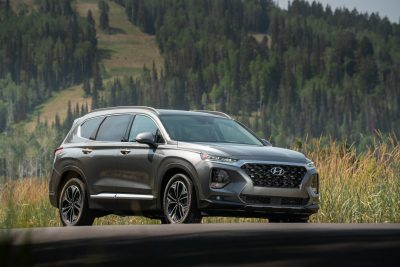 Hyundai also equipped the 2019 Santa Fe with another innovation, the world’s first Safe Exit System (SES.) 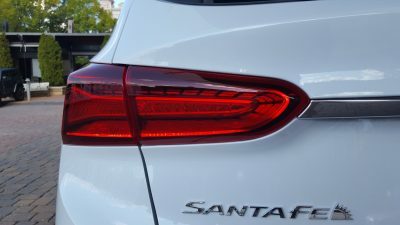 Utilizing the Blind Spot Monitoring system, the Santa Fe can keep the driver from disabling the rear child locks when it senses an incoming vehicle in its blind spot, with the rear door even staying locked until the vehicle in question passes. 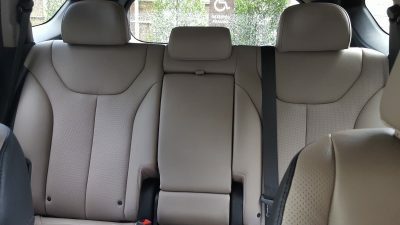 Once it does, the child locks can be disabled, and passengers can then exit the Santa Fe. 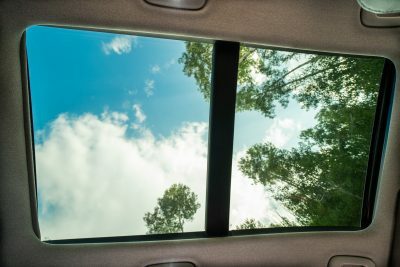 With these layers of safety, look for the Santa Fe to be a popular choice for young active families that want maximum levels of safety for their children, and crave clever and practical solutions at tackling this problem head on. 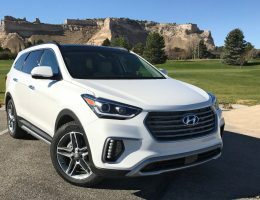 Pricing for the 2019 Hyundai Santa Fe reflects the broad slice of customers that the Santa Fe aims to appeal to with the base SE model starting at $25,500. 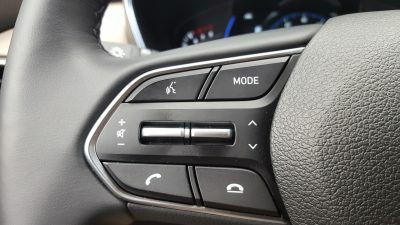 The SE is no penalty box, with buyers getting equipment such as Forward Collision Avoidance (FCA,) Blind Spot Avoidance (BCA) and Hyundai’s all new Safety Exit System standard. 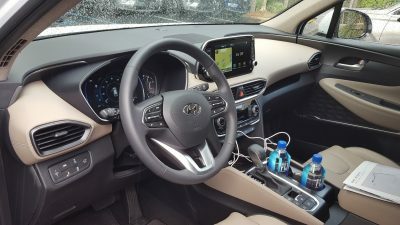 Other standard goodies include Hyundai’s adaptive cruise control, Android Auto and Apple CarPlay capability, as well as high beam assist headlights. Meanwhile SEL and SEL Plus models amp up the standard equipment, and bring a whole feats of standard and luxury amenities to customers. 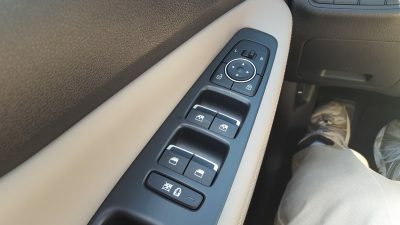 They include heated front seats, fog lights, 18-inch alloy wheels, sliding second row seats, as well as leather wrapped upholstery for the steering wheel and shift knob. Pricing reflects this leap in quality with the SEL Limited crossing the $30,000 barrier. 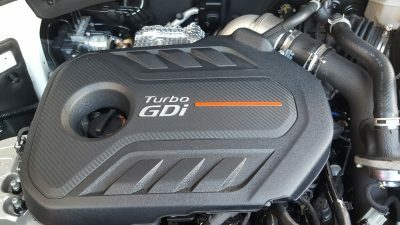 Stepping up to the range topping turbocharged Ultimate model like our tester brings the base price just below $40,000, but get past the initial sticker shock, and the Ultimate transforms into a very compelling SUV buy. 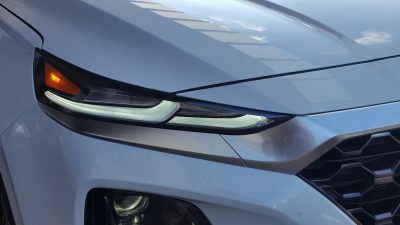 Wireless mobile charging technology is standard issue, and a full color heads up display system is also standard equipment. 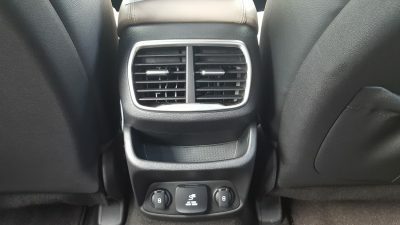 Other features border into the territory typically occupied by more luxurious entries, and include heated rear seats, Surround View rear view camera, rain sensing wipers, and memory settings for the drivers seat. 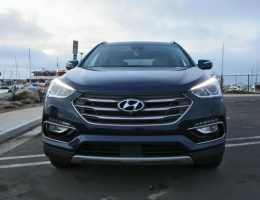 With such a strong focus on value, safety, and providing the unexpected for its clientele, the 2019 Santa Fe aims to be a big disruptor in the SUV segment. 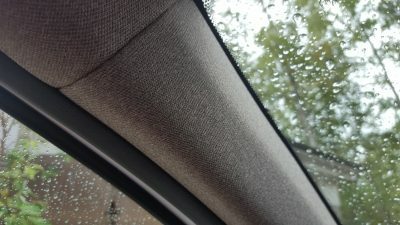 While the exterior styling is not as revolutionary as folks expected, it is a welcome evolution that should still make it stand out in a crowd. 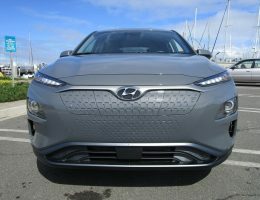 Factor in the extensive suite of standard equipment, and Hyundai could potentially have another sure fire hit on its hands. 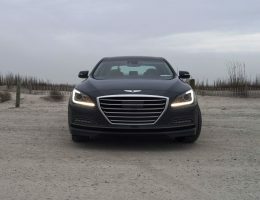 We look forward to eventually sampling the three row version, to see if it can bring Hyundai’s recent run of success full circle.